A 22 year-old-man has been rushed to hospital after being stabbed in an incident near Fallowfield, Greater Manchester Police (GMP) have confirmed. 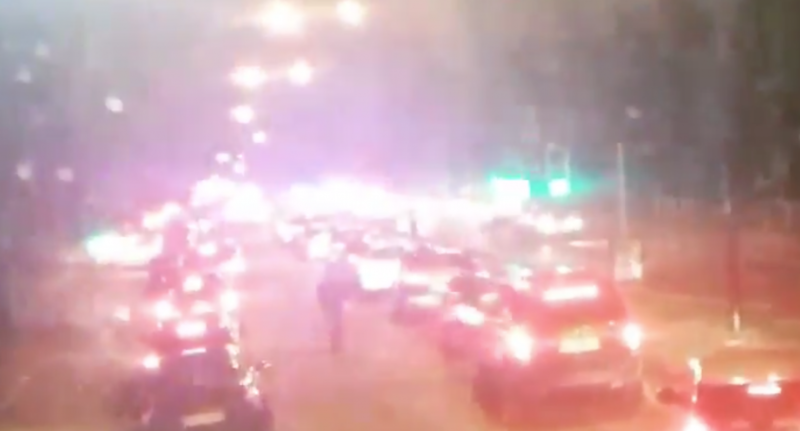 There was a heavy police presence close to student area Fallowfield on Monday night, with the A34 Kingsway closed at the junction with Moseley Road on the border of Fallowfield and Burnage. Eyewitnesses at the scene said they were told that a ‘major incident’ had been declared, with one telling Manchester Evening News that they saw a coat “covered in blood” at the scene. Paramedics were also on the scene, a video posted on Twitter shows a traffic jam at the Fallowfield Loop with sirens and emergency vehicles in the background. The incident is thought to have taken place close to the Armitage Sports Centre, home to the University of Manchester playing fields and gym. Greater Manchester Police have released the following statement: “At around 6.55pm on Monday 28 January 2019 police were called to Kingsway in Levenshulme to reports that a man had been stabbed. “Officers attended and a 22-year-old man was taken to hospital where he is currently receiving treatment for serious injuries. No arrests have yet been made. Stagecoach Greater Manchester tweeted: “50 Service diverted Parrs Wood bound due to a police incident on Kingsway via Moseley Rd Burnage Lane Mauldeth Rd will be unable to serve stops on Kingsway and Grangethorpe Drive until further notice”.